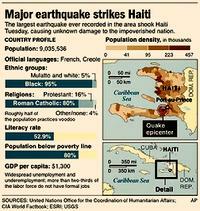 Haiti is in Ruins & Misery .... rocked by Aftershocks in the dead of night. The World Responds To An Island Nation's Plight .... yet it took a 7.0 Earthquake to Capture It's Attention .... Haiti was already among the worlds poorest nations in the Western Hemisphere. 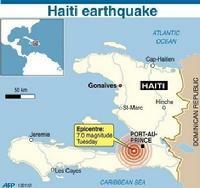 Three million Haitians have been affected by this Quake. "Haiti has moved to center of the world's thoughts and the world's compassion," British Prime Minister Gordon Brown said. An AP videographer saw a wrecked hospital where people screamed for help in Petionville, a hillside district that is home to many diplomats and wealthy Haitians as well as the poor. "A school near here collapsed totally," Petionville resident Ken Michel said after surveying the damage. "We don't know if there were any children inside." He said many seemingly sturdy homes nearby were split apart. Associated Press videographer Pierre Richard Luxama in Port-au-Prince and AP writers David Koop and Olga R. Rodriguez in Mexico City; David McFadden and Danica Coto in San Juan, Puerto Rico; Matthew Lee in Washington; Tamara Lush in Tampa, Fla.; and Jennifer Kay and Christine Armario in Miami contributed to this report. What's it like in Haiti today? A child squats to defecate yards away from a sidewalk where women press plantain into bite-sized pieces for frying and a naked toddler plays with a pile of rice on the filthy ground. Nearby, a dead body has been dumped on the street, right in front of a sea of morose people sitting on grubby mattresses, and a garbage collector uses a shovel to scoop up soggy black mounds of putrid trash composed of plastic water bags, polystyrene plates, orange peel and tin cans. Stray dogs forage. Sanitary conditions in tent cities like this one in Port-au-Prince's once elegant Champs de Mars park around Haiti's crumbled presidential palace are worsening by the day as hundreds of thousands of survivors of last week's earthquake cram together to eat, sleep, wash and defecate. "It's miserable here. It's dirty and it's boring. There's nothing to do but walk about," said Judeline Pierre-Rose, 12, who misses her comfortable home with its couch and TV. "People go to the toilet everywhere here and I'm scared of getting sick. My twin sisters vomited last night," she said. 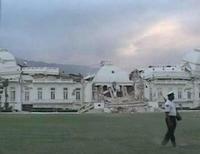 Rescue teams and food aid have poured into Haiti since the Jan. 12 magnitude 7.0 earthquake devastated the capital. They are burying the dead and attending to the injured, but they must also deal with an estimated one million people made homeless by the quake are having to fend for themselves. Hundreds of thousands have used mattresses to mark out open-air living areas on blocked-off roads and grassy areas between dead zones of earthquake rubble in Port-au-Prince. they have also built crude tents by tying bed sheets to trees. At the Champs de Mars, one family has propped the scavenged cabin of a smashed up pick-up truck on chunks of concrete debris to make a makeshift house with a wooden plank for a door. Nearby, an entrepreneur is renting out a generator for people to charge their cellphones. Aid group Action Against Hunger has installed water distribution points at the camp where people crowd round with buckets, but emergency latrines have yet to be installed. A large area around a small cluster of tatty and overflowing public toilets is full of clumps of human excrement and dirty tissues. A large public fountain where many strip off to wash has turned an opaque dark green covered with scum and garbage. "It's a catastrophe. It's dangerous because health is a very precious thing and you can't have all these people living near trash and dead bodies. It could spark an epidemic," said Gelin Wesnel, 34, a local Haitian Scout in full uniform manning a first aid tent nearby. As families settle in after nine days camped out -- preparing food on the dirty ground, cooking on charcoal fires and walking about in flip-flops through toxic dark gray puddles, nobody is doing anything about hygiene. Click Image To Enlarge: Presidential Palace: "BEFORE"
Click Image to Enlarge: Presidential Palace: "AFTER"
The World Grid for the Last Quarter Lunation of : 7 Jan 2010 shows Saturn hovering over Haiti. However by itself it only indicates "Losses" or "Critical Turning Points". "Save Yourself The Best You Can "
18� N 27' 04" / 72� W 26' 42"
"Death of the Government and/or Government Officials . = Moon / MH: "A Great Collapse"
"Sudden Death at A Place of Adversity"
"Explosive or Revolutionary Collapse to an already Poor Stricken Community"
"Dependent, Dirty, Great Suffering and (becomes) "A Public Interest Sensation"
Natal: "Nature - The Great Happenings"
SA: "Nature - The Great Happenings"